For more than twenty years we lived in a subdivision with lots of short streets and cul-de-sacs. Getting to the “outside” involved going down the hill, around the bend, a few turns and finally a four-way stop at Bradley Road. From there Bradley took us towards town or to the shopping center a couple of blocks away on Clark. Almost everywhere we wanted to go involved Bradley Road. In the late Nineties we were looking forward to early retirement and a year or so of travel in our RV. We had lived in California for thirty-some years and knew that one of our goals of traveling was to find some place else to live. Our children were grown and beginning their own lives. We figured they would move elsewhere, so why shouldn’t we? During the year or so we planned this trip, every time I turned right to go up the hill on Bradley, I would wonder what my new “Bradley Road” would be like. Would it be a gravel road out in the country? Would it be a main route through a smallish town? Would it be a highway? Would it have snow sometimes or ditches along the side to catch plentiful rainfall? How would it affect my every-day life? Two years after retirement, we moved into a farmhouse in Virginia’s Shenandoah Valley. My “Bradley Road” was US 11, one of the oldest highways in the country. A paved, two lane highway, it connects numerous little towns in the largely rural valley and has its share of snow, rain, dead skunks, and Civil War markers. Two miles to the left is the county seat with the only two grocery stores for several miles. In those two miles, I passed a stone railroad trestle built before the Civil War, a house that used to be a post office across the highway from what used to be a stage stop. That Valley Pike was as different from Bradley Road as it could get. Old Valley Pike is Main Street through town. When I had lived there a couple of years, I was delighted to realize I could sit in a cafe and see at least someone I knew out in the street. By the time I left last summer, I would not only recognize the downtown regulars but would know many of the people in the cafe as well. Now I am back in California. The four-way stop at Bradley is a traffic light with left turn lanes. The shopping center is three shopping centers on the corners of Bradley and Clark. My new Bradley? It’s Clark, three miles or so from that intersection. Home is a mobile home park at the edge of Old Town Orcutt where I can walk to a grocery store, several scrumptious restaurants and cafes, a fitness center, several antique shops, and a couple of nurseries. Ok, so I probably won’t walk to the nurseries because plants tend to attach themselves to me as I go looking and then I have to pay for them and lug them home. But you get the picture. Each of us has a Bradley Road. It’s the road that takes us to our jobs, our churches, schools, doctors, and most of all, back home again. When you travel, you see many places that look nothing at all like where you live. It is easy to think “oh, I could never live there” and then you realize that each of those places is home to many people who could not imagine living anywhere else. What does your Bradley Road look like? 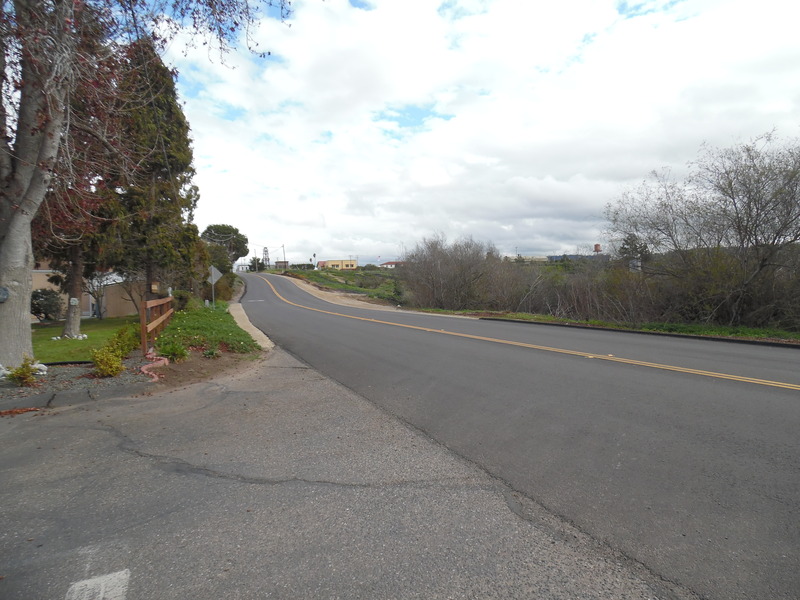 This entry was posted in Uncategorized and tagged Orcutt CA, road close to home, Shenandoah Valley, US 11. My kids have a sayng – “Home is where the Air Force sends us.” As I follow the kids and grandkids, that’s my saying too. I’ve had many a Bradley Road – 40 plus years in Delaware. I moved from home into apartments, houses, back to apartments. In Albuquerque, I had a couple of places. Now in Minot, ND, I’ve had a couple of places. Right now my Bradley road is Central Avenue which runs through downtown. Two lanes of busy that connect me to downtown, my job, easy access to Route 83 which is the main road to all things. I suspect a lot of folks share your son’s definition of home. I remember before we left on that first long retirement trip there were parts of the country I didn’t care about seeing but we went there anyway. That’s when I realized that everybody has a “Bradley Road”, even in places I didn’t think I’d want to be. And home is home, whether it is the muggy cotton fields of Mississippi or the sand hills of western Nebraska. I didn’t know nothing about ND. I hope to erase ND from my memory soon. I don’t know why people choose to retire here. But home is where family is! I hope for your sake that family gets moved to some place warmer so you, too, can enjoy a warmer clime. It is definitely great to be close to family!! We even had TWO…count ’em…family dinners together this week!